Argentina captain Juan Roman Riquelme has announced his international retirement at the age of just 28. 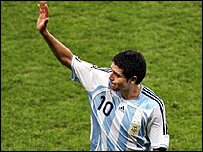 Riquelme said he wanted more time to look after his ill mother and was upset by criticism of his performances. "I can take criticism but family comes first before soccer," said Riquelme. "I have no right to make her suffer due to my part in the national team." Riquelme won 37 caps and scored eight goals having made his debut in 1997. He added: "Since the World Cup, my mother has been taken to hospital twice and my responsibility is to take care of her. "It will hurt me deeply not to wear the Argentina shirt again but my mother's health comes first. "My mother is my mother and I can't compare her with the Argentina shirt or anything else." Riquelme will continue to play his club football for Spanish side Villarreal.